I just got my coat via delivery earlier today, after ordering it at the start of the year. An I've got to say it is an absolute thing of beauty! I completely agree with everything that everyone else here has said. I cannot fault it one bit. As a big fan of David Tennant's doctor. It gives me immense satisfaction to finally be a proud owner of one of these coats, that I've heard hyped up so much everywhere online. I've tried it on twice since getting it today. Once just casually and then again with the rest of my Tennant gear, an it absolutely looks the part. 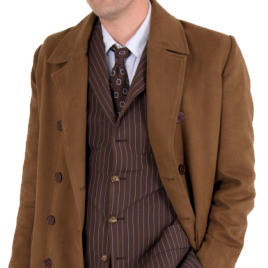 It is well and truly a cut above the rest of the replica coats that you can find online. Which whilst still being good don't quite match up to this. An actual coat that looks exactly like David's from the show, that you could probably get away with wearing just about anywhere! I would highly recommend it to anyone who is as big of a fan of David's doctor as me, that has a bit of money saved up that they don't plan on spending. It is honestly worth every penny, an I look forward to wearing it at future events as well as inevitably when i'm out and about as well!